As a race committee chairman, … I am surprised at how few [sailors] seem to attempt to finish at the nearest point [favored end] of the finish line. Just as you should have an idea of which side of the beat is favored before you round the leeward mark, you should be thinking about the favored end of the finish line long before you get to it. When the racing is close, you can gain or lose boats in a heartbeat at the finish. Good finishing requires both strategy and tactics. In this post we’ll focus on strategy: things you do to finish fastest regardless of other boats. In a separate post we’ll break down finishing tactics. All the experts agree on the four key elements of finishing strategy: positioning in the final portion of the beat, finding the favored end of the line, using the laylines, and shooting the line. Don’t stop looking for advantages in the final portion of the beat. If you can catch the last shift or area of more breeze, you will certainly gain on your competitors. On many lakes, one side of the beat will be favored at the top. It’s easier to spot advantages as the course narrows toward the finish line. The last shift is like a persistent shift. Those closest to the shift will gain permanently. As Dave Dellenbaugh says in Beat Your Competition to the Finish, predicting the favored side of the course is not nearly a sure thing. So, if you’re not certain, the best thing to do is cover. We’ll talk about covering on the article on tactics. In any event, you need to keep sailing fast. The racing area gets more crowded with racing boats, committee boats, and boats that have finished. You’ll have to think harder about sailing in a lane of clear air. For more in this, see our post Sail in Clear Air. In many cases, the finish line will not be square to the wind as boats finish. For upwind finishes, the favored end is the downwind end of the line. To make sure you understand this, look at the diagram below and determine which end of the line is favored and why. Click on the answer link for a more detailed explanation. Which is the favored end? See an explanation here. The trick is to figure this out well before you get there so you can plan ahead. There are at least three ways to tell. If there are boats ahead, hopefully many of them will be finishing at the favored end of the line. This might give you a clue on where to position yourself. When you can see the set of the line, compare that direction to the sailing angles of boats near it. The boats on the lifted tack will point to the favored end. The flags on the committee boat are a great clue. You can often see these from a distance. Compare the set of the line to the flag direction to find the downwind end of the line. Each end of the finish line has two laylines. Identify the favored end of the finish line soon enough so that you don’t sail past the layline for the chosen end. There are two very good reasons for not sailing past the laylines: sail the shortest distance and gain tactical control. If you sail past the layline, you will always sail extra distance. Study the diagram below. Which boat has the best chance of sailing the shortest distance to the line? If no wind shift occurs, Red will sail the least distance to finish. Sailing on the layline generally gives you tactical control over other boats. We’ll discuss this further in the tactics post. The diagram below shows an example of tactical control on the layline. 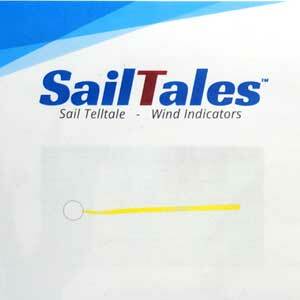 As you get within a few boat lengths of the line, turn up smoothly into the wind. You are sailing fast (aren’t you? ), so your speed will carry you directly upwind for a faster finish. Practice this maneuver so you can judge when to turn up without losing too much speed.